WOWSA Presents: Wise Women – Who's in control of your finances? 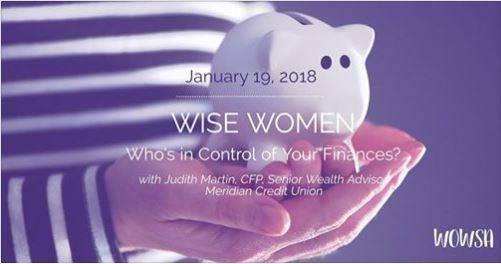 Presented by Judith Martin, Certified Financial Planner and Senior Wealth Advisor with Meridian Credit Union, join us for this educational morning workshop is designed for all stages of your financial life. This will be an inspiring start to the year that's sure to help you get your financial house in order for 2018 and beyond. Ticket includes breakfast and networking. Thanks for our event sponsor, Meridian Credit Union.